Experience from previous wildland/urban interface fires indicates that they can be spread by burning brands. These fires start small in areas where the brands can collect, such as under eaves or in corners. If the structure can be protected from a small fire for a short period of time, the chances of the structure surviving the wildland/urban interface fire may increase dramatically. 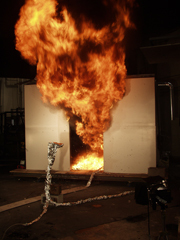 This experiment demonstrates the use ofdurable agents(in this case a protein-based compressed air foam) for protecting building exteriors from ignition. In 1996, more than 3,000 people in the United States died due to fires in their homes. Residential fire sprinkler systems have proven themselves to be effective life safety systems. BFRL, with support from the U. S. Fire Administration, conducted experiments to quantify the effectiveness of residential sprinkler systems designed in accordance with NFPA 13D. 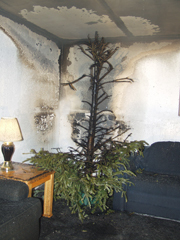 An example of these experiments is the following comparison of a "living room" fire, with and without residential sprinklers. Two rooms, each 3.7m (12 ft) X 2.4m (8 ft) high, were built in the Large Fire Research Facility at NIST. Both of the "living rooms" were furnished with a sofa, love seat, end table, lamp and carpeting. Room A had a smoke detector installed and Room B had both a smoke detector and a residential sprinkler system. A match was used to ignite the sofa. Within 40 seconds after ignition, the smoke detectors in each room activated. The fires in both rooms continued to grow. At 85 seconds the residential sprinkler activated in Room B. As a result of the water spray from the sprinkler in Room B, the fire is suppressed and safe conditions are maintained. The fire in Room A continues to grow. Flash over occurs in Room A, 195 seconds after ignition, with temperatures exceeding 600 oC (1100 oF). While there is no question that smoke alarms have successfully prevented thousands of residential fire deaths, their beneficial effect may be beginning to plateau. It is recognized that reducing the number of non-working alarms may produce some further reduction in fire deaths. Further, introducing more effective alarms in residential dwellings could have a greater impact in reducing deaths. However, there seems to be little incentive to produce and install better residential fire alarms until performance improvements can be demonstrated through objective, realistic, and accurate testing. For a full overview of the NIST Fire Research Division's work on smoke alarms, visit smokealarm.nist.gov. For many years, NIST has been doing research to promote the use and importance of residential sprinklers! Home Dangers: Every year more than 3,000 Americans die in home fires and more than 18,000 are injured. Children and the elderly are especially at risk in home fires because they are less able to escape when fire strikes. The best way to protect those who cannot quickly escape, and at the same time protect your home and belongings, is by installing sprinklers. Residential Sprinklers: Like the fire sprinklers found in most public buildings, residential sprinklers stand ready 24 hours a day to detect and extinguish fires before they can become a threat to lives or property. As life safety devices residential fire sprinklers are designed to react more quickly than their commercial cousins and thus need less water to do their work. Each sprinkler operates independently, so most home fires are extinguished by one or two heads with only a few gallons of water. Where do you find them? : Residential sprinklers used to be found only in a few, upscale homes. Today many areas require sprinklers in all new apartments and some require them in all new homes. The sprinkler industry supports a program with Habitat for Humanity to install sprinklers in homes they build. So increasingly sprinklers are protecting low income Americans. Water Supplies: Fire sprinklers require a reliable source of water; either a city water connection or a storage tank for about 100 gallons and a pump. Sprinklers can share a common supply and piping with the domestic water system, reducing cost but requiring additional storage capacity. The main problem with stored water is protecting it from freezing. Proper Design: Many builders offer fire sprinklers as an option. Where sprinklers are installed later it is important to use a qualified designer and installer. For example, sloped or beamed ceilings require special design and installation considerations. Look for a certified fire sprinkler contractor to be sure its done right. Maintenance: Fire sprinkler systems require periodic maintenance and inspection. This is not a do-it-yourself job and should be left to a qualified contractor. Never paint sprinklers, it can prevent them from operating in a fire. Insurance Savings: If you have fire sprinklers you may be eligible for a discount on your property insurance. Ask your agent. Don't Forget the Smoke Alarms! Even though fire sprinklers are effective life safety devices you still need smoke alarms. Some fires can begin as smoldering fires that produce smoke and gases but without appreciable heat to activate the sprinklers. Smoke alarms are needed to provide warning for these situations. 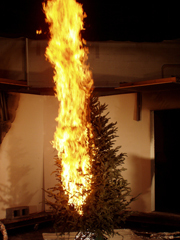 Although the number of Christmas tree fires is low, these fires carry a higher level of hazard than other fires that occur in a residential structure. 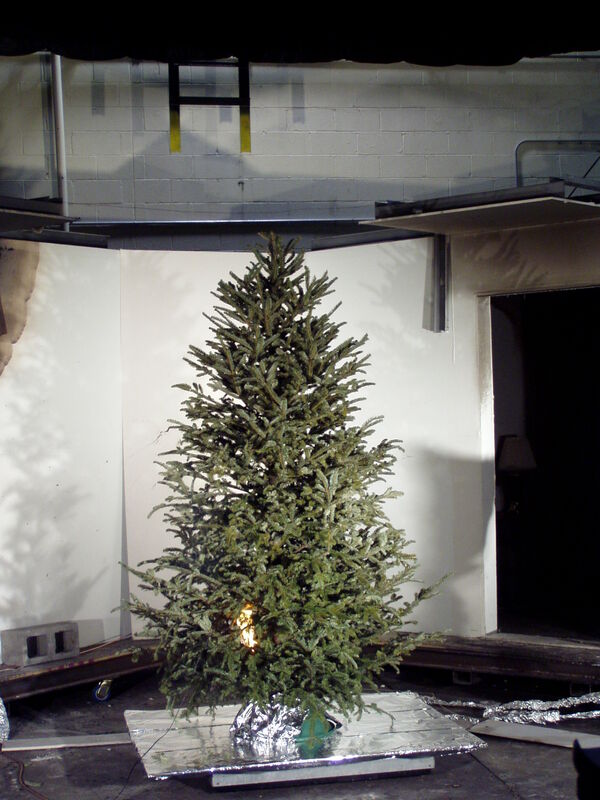 This study, supported by the U. S. Fire Administration, has the following three objectives: 1) characterize the heat release rate of dry Fraser fir trees 2) demonstrate the ignition resistance of a tree with a high moisture content and 3) examine the impact of a residential sprinkler on the heat release rate of a dry tree that is on fire in a compartment. The heat release rates of the trees which were allowed to dry ranged from 3.2 MW to 4.3 MW. Trees that were kept in water, so that the needles maintained a moisture content in excess of 100 %, self-extinguished after being exposed to a flaming book of matches. 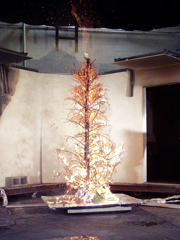 The data from the furnished sprinklered room experiment demonstrated that even under conditions of extreme fire growth, a single sprinkler was able to prevent flashover and limit the spread of fire to other objects. The peak heat release rate, from the sprinklered room, was limited to approximately 1.8 MW. 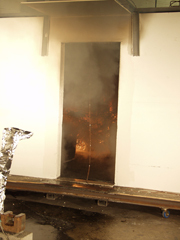 The furnished non-sprinklered room experiment generated a post-flashover heat release rate in excess of 6 MW. The photos above are a series of photographs that show the stages of fire growth from just after ignition to just before total burn out. The span of time from left to right is approximately 60 seconds. Note the amount of vertical flame spread versus the horizontal flame spread in the second photograph. In the last photograph of the series, the majority of the tree trunk and many of the larger branches are intact after the needles have burned away. 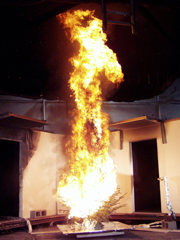 The left two photographs above are comparison of the sprinklered room (left) with the unsprinklered room (right; both photos were taken at approximately 1 minute after ignition). 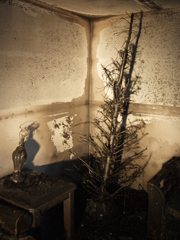 The right two photos are post fire photographs (sprinklered room on the left and non-sprinklered room on the right). 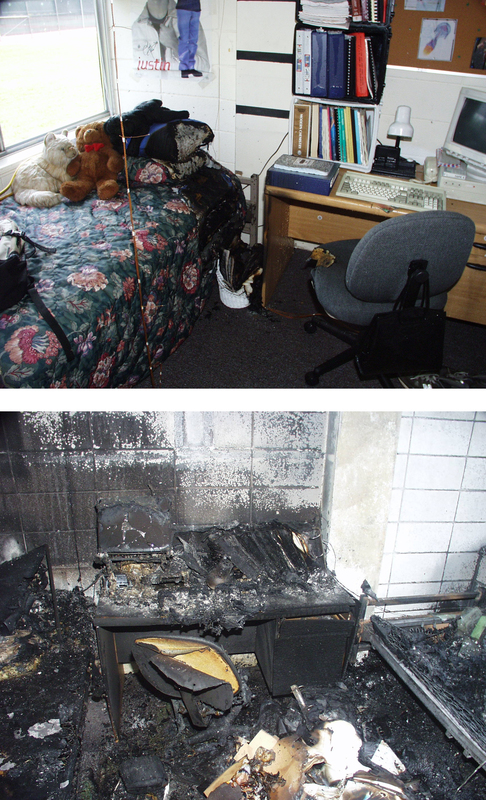 These post-fire photographs of the dorm rooms show the difference a sprinkler makes. There is little visible damage the in the top photo that had a sprinkler in the room; there was no sprinkler in the dorm room in the lower picture. 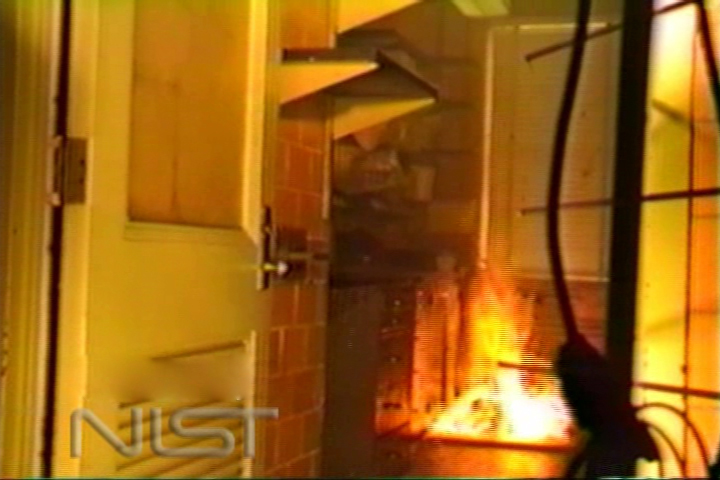 In 2001, the Fire Research Division at NIST wrapped up experiments performed in conjunction with the US Fire Administration (USFA) and the University of Arkansas. The objective of this study was to compare the levels of hazard created by room fires and sleeping room fires in a dormitory building with and without automatic fire sprinklers in the room of fire origin. The report describes a series of experiments where fires were initiated in dormitory sleeping rooms and day rooms. The description of the experimental conditions includes: the geometry and construction of the building, the fuel load in the sleeping rooms and day rooms, and the location of the instrumentation used to measure gas temperature, oxygen, carbon dioxide and carbon monoxide concentrations and heat flux. Smoke alarm activation and sprinkler activation times are also reported. Five experiments were conducted. In two of the experiments, the door between the sleeping room (room of fire origin) and the corridor was closed. In the other three experiments the door from the sleeping room (room of fire origin) remained open to the corridor. In each case, door closed or door open, one of the experiments was sprinklered. The results from the experiments comparing the sprinklered and non-sprinklered sleeping room are also presented in the reports. The results from these experiments demonstrate the potential life safety benefits of smoke alarms, compartmentation, and automatic fire sprinkler systems in college dormitories and similar occupancies. Click here to request a copy of the 2 DVD set for this study! The National Institute of Health (NIH) had expressed a need for developing sprinkler design criteria for use in chemical laboratories to ensure adequate, cost effective fire protection. The Center for Fire Research and The National Institute of Standards and Technology (NIST) teamed up and composed a series of fire tests in typical chemical laboratories in order to address the use of quick response sprinkler technology. For each test, the performance of an automatic sprinkler system in extinguishing a fire originating in an acetone spill was evaluated. The test parameters included standard sprinklers with exposed steel piping, quick response sprinklers with exposed steel piping, quick response sprinklers with exposed plastic piping, quick response sidewall sprinklers and no sprinklers. Measurements of air temperature and the concentration of oxygen, carbon monoxide and carbon dioxide were taken. A free burn test was conducted to characterize the heat release rate of the initial items ignited. An tragic and, sadly, preventable fire occurred on the night of Feb. 20, 2003, in The Station nightclub at 211 Cowesett Avenue, West Warwick, Rhode Island. A band that was performing that night used pyrotechnics during its performance that ignited polyurethane foam insulation lining the walls and ceiling of the stage platform. The fire spread quickly along the ceiling area over the dance floor. Smoke was visible in the exit doorways in a little more than one minute, and flames were observed breaking through a portion of the roof in less than five minutes. Egress from the nightclub, which was not equipped with sprinklers, was hampered by crowding at the main entrance to the building. One hundred people lost their lives in the fire. Of the fatalities, 95 were due to the inability of the occupants to evacuate before being overcome by the untenable conditions along the egress path. 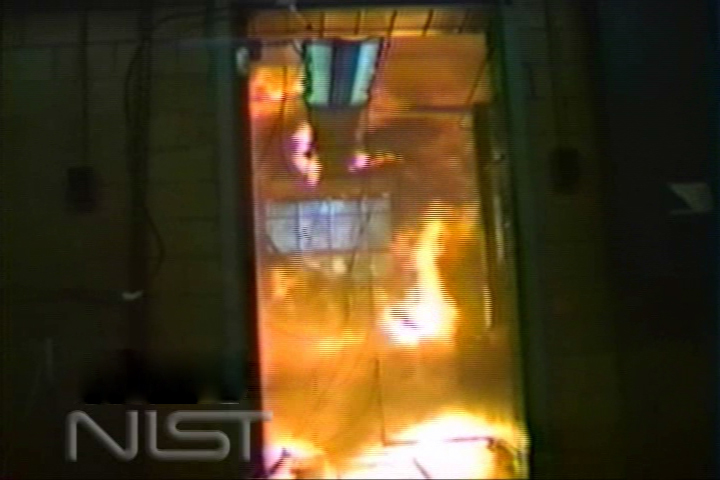 On Feb. 27, 2003, under the authority of the National Construction Safety Team (NCST) Act, the National Institute of Standards and Technology (NIST) established a National Construction Safety Team to determine the likely technical cause or causes of the building failure that led to the high number of casualties in that fire. One conclusion drawn from the investigation was that this tragedy might have been prevented through the implementation of sprinklers. In the videos below, showcasing full-scale recreations of the fire with and without sprinklers, it is highly evident the life-saving potential that sprinklers possess. While we cannot change the past, we can ensure such tragic losses of life are prevented in the future through adoption and implementation of building and fire codes requiring the use of sprinklers. To read more about NIST's sprinkler research, please visit the Reports Archive.